Proposed zoning of Sunnyside/Woodside, Queens. Image: Courtesy of NYC Department of City Planning. Contextual rezoning would impact 130 blocks in Sunnyside and Woodside neighborhoods. 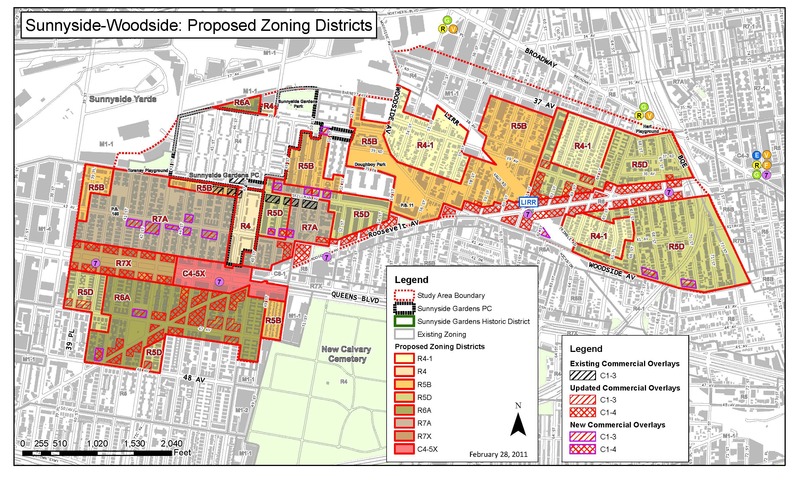 On May 25, 2011, the City Planning Commission heard testimony on the Department of City Planning’s proposal to rezone 130 blocks in the Sunnyside and Woodside sections of Queens. The proposal would impact approximately 2,800 tax lots generally bounded by the Sunnyside Rail Yard and 37th Avenue to the north, Roosevelt and Woodside Avenues to the south, the Brooklyn-Queens Expressway and 72nd Street to the east, and 39th Place to the west. The Sunnyside and Woodside neighborhoods were established after the opening of the Queensboro Bridge in the early 1900s and the subsequent extension of what became the elevated No. 7 subway line. Sunnyside, located in the western portion of the study area, is predominately characterized by large, multi-family apartment buildings. Woodside is primarily characterized by one- and two-family homes and small apartment buildings. The area’s current zoning includes R4, R5, R6, R7-1, C4-2, and M1-1 districts. The zoning, unchanged since 1961, permits a wide range of building types. Planning’s proposal seeks to replace the current zoning with contextual zoning districts — R4-1, R5B, R5D, R6A, R7A, and C4-5X — to reinforce existing development patterns, establish maximum building heights across the area, and provide residential development opportunities along the area’s major corridors. The proposal would apply the City’s Inclusionary Housing Program to the R7X and C4- 5X districts proposed along a stretch of Queens Boulevard in Woodside. Planning also proposed amending the zoning text to permit small sidewalk cafes along Queens Boulevard between 39th and 48th Streets and portions of Skillman Avenue. No one opposed the proposal at the Commission’s May 25 public hearing. Joseph Conley, chair of Queens Community Board 2, testified that CB 2 requested the rezoning after members of the community expressed concerns about a multi-story building being developed on a site formerly occupied by a number of small stores destroyed by a fire. Conley stated that the proposal was appropriate and should not be “tinkered with” as it goes through the review process. Irving Poy, director of planning and development at the Queens Borough President’s Office, testified that Borough President Helen M. Marshall supported the rezoning. CPC: Hearing on Sunnsyide-Woodside Rezoning (C 110207 ZMQ – rezoning); (N 110208 ZRQ – text amend. ); (N 110209 ZRQ – text amend.) (May 25, 2011).